Last week the U. S. government was shutdown in the midst of a political squabble. 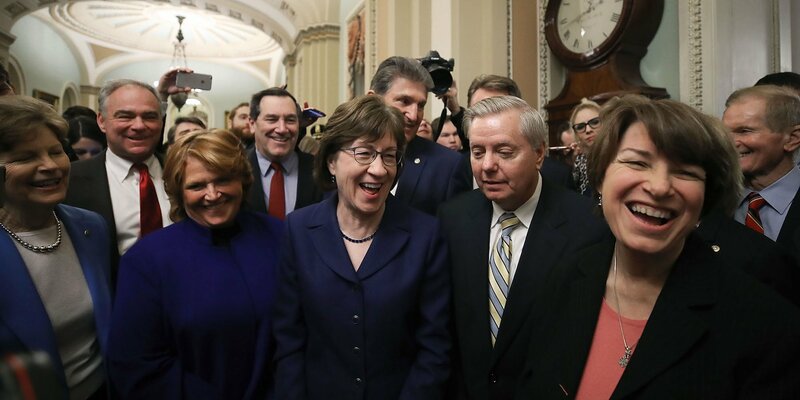 What could have been a lengthy and grim mess, a bipartisan group of 23 moderate senators known as the Common Sense Coalition led by Republican Sen. Susan Collins were able to successfully create the united front needed that brought the 3 day blackout to a halt. What offers the greatest opportunity for growth and development when it comes to your work is described as a character or personality strength. 53 social scientist have researched and assembled a list of 24 character personalities that are universal, measurable, morally valued, fulfilling and trait like. Strengths lead to a recognizable human excellence or an instance of human flourishing. In a compromise that halted the shutdown in a short span of time, it is reasonably apparent this group drew on the right personality strengths, in the right amount, in the right situations to create the outcomes they wanted. Bravery describes a willingness to rise up and confront difficult or threatening situations. Instead of the usual heated rhetoric which is rapidly dividing the Republicans and Democrats, this group evaluated the risks involved in facing up to the challenge. They maximized the strength of bravery to confront psychological and moral challenges. The usual hype was pushed to the curb and their bravery of possibly making some people angry enabled them to persevere through a tough time. Leadership describes your ability to both organize and encourage others in order to help them accomplish group goals. It is reported that Senator Collins used a traditional Native American talking stick, requiring that the person holding the stick speaks and everyone else listens until the stick was passed to them. In her effort to help the group find the best pathway to take, Collins maximized her leadership strength to maintain team order, unity and cohesion. Fairness refers to a strong sense of what you believe to be right, and your desire to act in accordance with these beliefs. Caring deeply about understanding and hearing the perspectives of all the others without everyone talking over each other, Senator Collins’ use of the talking stick demonstrated her strength of fairness to act in congruence with her beliefs about right and wrong. Creativity describes your preference for producing new ideas and executing behaviors that are original. The novelty use of a talking stick for bringing order to a bipartisan group in favor of actually getting something done is maximizing creativity at its best. Collins chose to think outside the box and be innovative in order to solve a problem and make things work. Teamwork refers to your sense of belonging and commitment to a team for a greater good. Though coming from two different parties, there’s no doubt that all 23 exhibited strong allegiance to the team and obviously made a fair contribution when each one had opportunity to hold the talking stick. The strength of teamwork embodied this group in orienting towards helping to achieve the best outcome. There were undoubtedly more of the 24 character personalities used in brokering this bipartisan solution. One thing is for sure, when you have the opportunity to do what you do best each day, you’ll feel happier, healthier and enjoy more success at work. If you are a leader or business owner, who want to achieve better performance, satisfaction and fulfillment at work, then you need to learn strengths-based strategies to get the best from yourself and people you work with, coach and lead. Dr. Deana is as an international keynote presenter offering expertise on the practical applications of positive psychology, neuroscience and social intelligent leadership. Her mission is to work alongside organizations to facilitate positive leadership for the 21st Century and to put more smart-driven women in the position to flourish by advancing the expression of their strengths. Connect with her on Twitter, LinkedIn and visit DrDeanaMurphy.com and Lead2FlourishWomen.com for more.